A special flag was raised at Purbeck District Council’s offices on Monday 19 June to mark the start of Armed Forces Week. 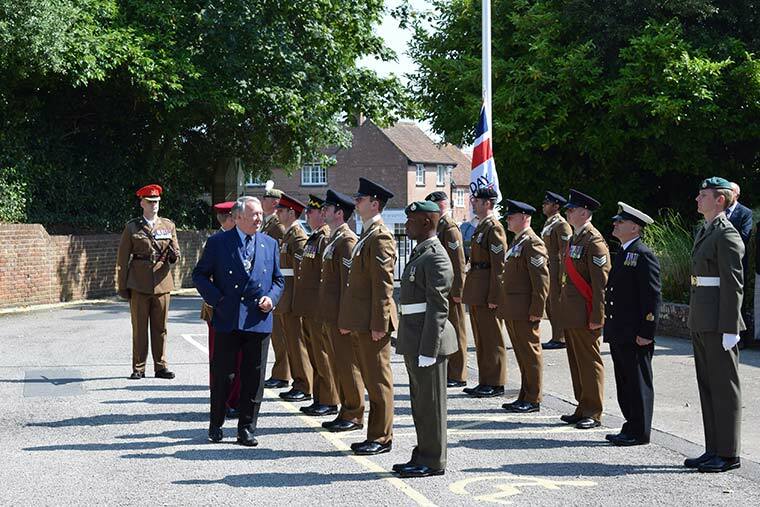 An Armed Forces flag was raised at the offices of Purbeck District Council on 19 June to herald the start of Armed Forces Week. Lieutenant Colonel Matthew Wilkinson KRH, Commanding Officer of the RAC Training Regiment, Bovington; the Royal Navy and soldiers based at Bovington and Lulworth took part in the ceremony to raise the Armed Forces flag at Purbeck District Council’s offices on 19 June. It marked the start of Armed Forces Week. Other dignitaries included the Chairman of Purbeck District Council, Cllr Bill Trite and Wareham Town Mayor Cllr Malcolm Russell. Councillor Trite said: “On behalf of the people of Purbeck, I express our appreciation and gratitude for all the Armed Forces do in our interests and in the course of their duty to the Nation. “The involvement in military operations, when circumstances require, is the ultimate expression of the role of the Armed Forces – a task which demands constant preparedness, the highest standards of training and, indeed, the willingness if necessary to make the ultimate sacrifice in the defence of this country, its people and its way of life. Lieutenant Colonel Matthew Wilkinson KRH, Commanding Officer of the RAC Training Regiment, Bovington, said, “Armed Forces Week is about the local communities in which we serve and that is why it is so important we are here today. “It is a key part of reaffirming each year the military covenant that is the link between the serving community and their families and the local communities in which they live. When we are away from our families on operations, it is the support of these communities which gives us strength. The specially-commissioned Armed Forces Day flag will fly at the council’s Westport House offices until Monday 26 June 2017. Armed Forces Day takes place on Saturday 24 June and is an opportunity for the nations to show its support to service men and women past and present.